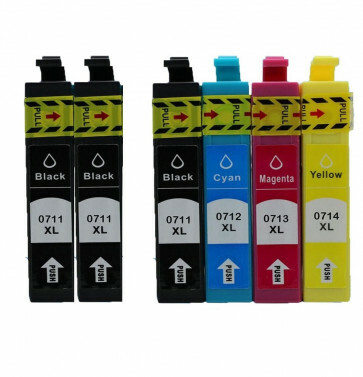 6 Multipack Epson T0715 BK/C/M/Y High Quality Remanufactured Ink Cartridges. The ink is cheap but it also preforms like cheap ink. Fast delivery.Good quality inks and good price! Should offer a recycling program. The Ink cartridges are of equal quality to the name brand versions - at a fraction of the cost! Shipment was timely and efficient. Zero complaints - lots of satisfaction. I love this paper that I have ordered for photography and using for my canvas. Thank you so much your your speedy delivery and easy online shopping. Pleased with the ink products I received. Best price. Good product. Delivery could have been a little faster, but was well within guidelines. I'm very satisfied with InkjetsClub.com. I feel like their prices on ink are unbeatable and I received them very quickly. They are not OEM but I knew that going in and for not being OEM they print great, perfect for all our printing. I used them a few years ago to get this same ink that I got this time and was pleased then too and for the last two years.The only unfortunate thing is that my printer recognizes them as non-HP cartridges and warns me that the quality may not be as good. The cartridges work fine. The sales/promos they run are great deals. Quick and easy ordering from their website.Ink arrived in about a week. There are lots of caveats in the instructions - things about possibly overfilled cartridges, printer won't recognize the cartridge,stuff like that. I'll have to see how it works out. The order was shipped to my home promptly and it arrived quickly. The order was filled accurately although it was not at all complicated... I am sure I will use InkjetsClub.com again in the future! I am very impressed with the timely delivery as well as the clear communication about the arrival of my delivery. I have only tried one of the cartridge colors so far and I am very pleased with its' performance. I look forward to purchasing from InkjetsClub again. Satisfied with our timely order. My order was accurate and shipped fast. The ink works great! Attractive pricing and prompt delivery. Great product at a greater price. Thanks a lot. Received my ink in a timely and it seems to be great. Have to wait and see how long it last.